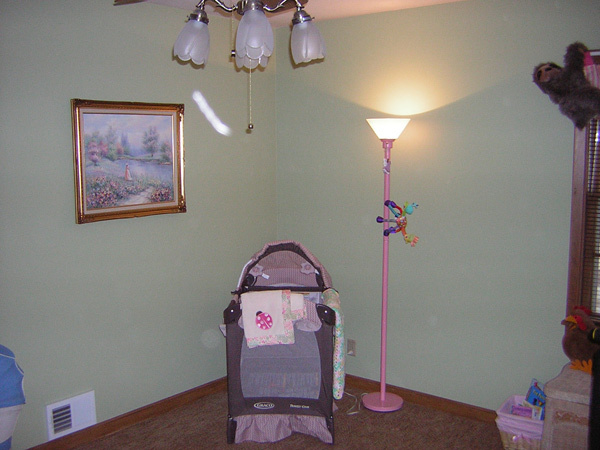 Several people have asked to see pictures of the nursery, so I thought I would post a few. We got the room put back in order this morning and set up the portable crib and hung the valances and cleaned out the dresser and put all of Siri’s clothes away. This will give you a much better idea of how it all looks. The color is called “Northern Pear Tree” and it is from the No-VOC line of paints at Home Depot called Freshaire Choice. This was my first experience using No-VOC paints and I must tell you that it made the painting experience much more pleasant for me. And the room has virtually no new-paint smell at all, which is a very good thing. 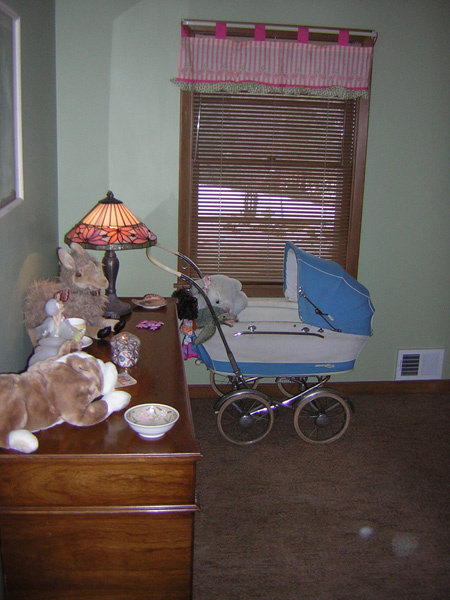 That is Harald and Karin’s baby carriage from when they were born. It’s a Simo Babylux from Norway. They don’t make them any more.